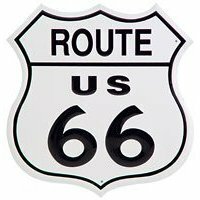 Route 66 – the Mother road. “Get your Kicks on Route 66”! So come enjoy one of the California’s great stretches of America’s Main Street, and grab a few caches along the way. • Do bring, and drink plenty of water – The desert can be hot and dry – stay hydrated. • There is gas in a couple of spots along the way (Ludlow & Amboy, and at the end of the Route at Goffs Road) so be sure your tank is full before you start. • Don’t get so caught up in the caching adventure and forget the rules of the road. • Please be sure to pull completely off the road when you stop, and check carefully before getting back on the highway. • You won’t encounter too much traffic, however between Amboy and Kelbaker road you will see that traffic picks up a bit, but then slows down east of Kelbaker. • The first part of the route (probably the first 100 caches or so) is on a rough paved road, but any regular car can drive this, and the road smoothes out later. • There is no need to cross fences or go onto private property for any of these caches. • The desert is home to snakes (the Mojave side-winder and rattlers) lizards, as well as other small animals. Use caution. • There is a lot of beauty in this desert, cactus, wild flowers, Lots of trains, beautiful rock formations, and if you’re lucky enough to be there at the end of the day, the sunsets in the Mojave desert are spectacular! I know we are all in a rush to get as many caches as quickly as we can. But do yourself a favor and stop and smell the flowers. We hope this caching trip will be a fun and wonderful memory for you. We have an Information sheet available for any one interested. Just drop us an email and we will get that to you.